serving sloppy joes to their fresh scrubbed kids and withdrawn husbands. 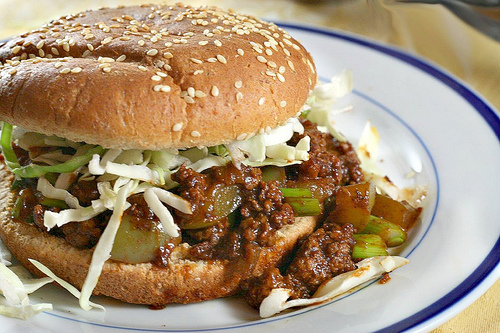 The entire time I was growing up (in the post-Julia Child, Alice Waters and Wolfgang Puck era of California Cuisine), I only encountered a sloppy joe between the covers of books. The books were invariably slightly out of date, with lunch ladies (also a foreign concept) serving up steamy sloppy joes in the context of a school cafeteria to girls in bobby socks and boys with pompadours. I had some idea of what a sloppy joe was, thanks to my mother’s 1955 edition of the Better Homes and Garden Junior Cookbook, which blithely incorporated cans of condensed soup, “summer drink powder” and canned fruit cocktail into its recipes, but it didn’t frankly, sound like anything I would eat. The somewhat disturbing cans of “manwich” I glimpsed at the grocery store (we certainly never bought them) only confirmed my impression that sloppy joes were a thing of the past and should stay there. So next time you’re in the mood for something a little old school, with a modern twist, get out the napkins, because sloppy joes are just the ticket. Heat oil in a large skillet over medium high heat. Add turkey, green pepper and garlic and cook until turkey is cooked through, breaking up the meat. Add chili powder, ale, ketchup, chiles and worcestershire sauce, stir to combine. Reduce heat to medium-low and cook until the mixture thickens slightly. Add scallions and season to taste. Serve on toasted whole wheat buns, topped with cabbage. I never heard of Sloppy Joes until I moved to the States. And the first time I had them they were made with some boxed ingredients I did not care about. I love the ingredients here though, especially the spicyness from the chiles and chili powder. Sounds so good! Those sloppy joes look tasty! gorgeous photos and a very tasty recipe! 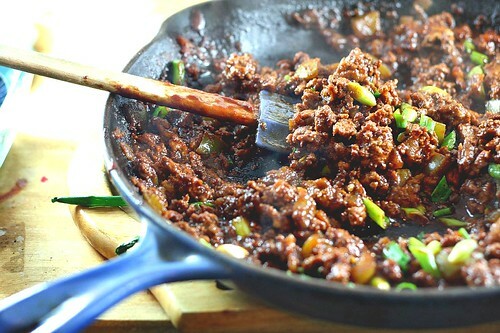 I have not had a sloppy joe in years, I am talking probably 30+ … I will have to make these some night. Adding it to my test kitchen now! I used to have these when I was a kid. Yours look so good! I stumbled across this recipe a couple of weeks ago, made it (although with mystery meat – I asked for lamb, think I got goat) and now my husband keeps asking for it over and over. Plus, we’ve only since seen Mad Men so I now get the Betty Draper reference! I do recall her making meatloaf in one episode. I’m on a thedomesticfront kick this week. Today I made these, perfect for a lazy Sunday. Absolutely delicious. I never had sloppy joes with cabbage topping before, wow was I missing out! This is going to be a regular in this house. Thanks Kate, for an easy and yummy meal!